You can connect to various types of databases and data files using the Create Data Source wizard. This wizard allows you to establish a connection to the data store by providing the required connection parameters. InLoox PM provides you with its own project data sources on the side panel left in the dashboard designer. 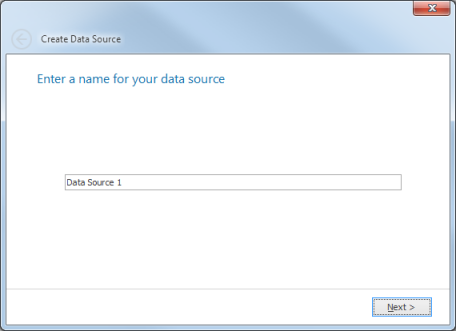 Data Source Name On the first page, enter the data source name and click Next. New or Existing Data Connection On this page, specify whether to use one of the existing connections or create a new connection, and click Next. This page only appears if you have already established a data connection in the current application. Connection Parameters If the application has not yet been connected to a database, or you have chosen to create a new connection in the previous step, the connection parameters page will be displayed. First, select the required data provider from the Provider combo box. The Data Access library supports more than a dozen different data providers, including MS SQL Server, MS Access Database, Oracle and MySQL. The other settings on this page depend on which data provider is used. Typically, you will need to specify the server name or the path to the database file, the user credentials, and the database name. Finally, specify the name of the new connection in the Connection name field and click Next. Finish On the last page, you can select a table or a view. The data from the selected table or view will be used in your application. Click Finish to close the wizard. Optionally, you can run the Query Designer, which will help you populate the new data source with data. To do this, check the Open Query Designer after closing the wizard check box before finishing. How to create a new data source and connect it to data | InLoox PM 8 • Copyright 1999-2019 © InLoox, Inc. All rights reserved.